repercussions of an angry vendor forced to take business at very low margins and still work seamlessly with the IT group. The CIO has to meet his budget; but also produce quality service to his business customers. Picking the vendor based on one metric alone; price, doesn’t provide the incentive or the environment to max out what the supplier fully can offer the IT group.In this white paper we explore how to facilitate step one of this process; establishing the proper internal processes and strategies to help build a solid inventory of vendors. We will explore, in a subsequent white paper, how to maximize the value of your vendor community. Supplier Life Cycle Mgt., Strategic Sourcing. 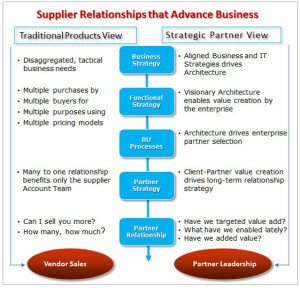 Supplier Strategy, Building Competitive Environments. Technology, Benchmarking, Using Industry Resources. Core Skills Sets, Self-Assessment of Strengths, Weaknesses, Career Values. Career Proposition, Skills Assessment, Gap analysis/Closure, Leadership Scorecards, Long Rang and Succession Planning, Mentoring, Coaching. Approve the fewest number of Suppliers to meet the capability requirements of IT while having a competitive landscape. Occasionally, young niche upstart suppliers may be added for achieving diversity objectives or for break-thru innovation or competition. Consider market conditions and helping your company in the marketplace when determining approved suppliers. For decisions that impact all of IT, gather input/support from each IT Group prior to making the decision. Those in IT affected by a change must be consulted. Their input must be gathered for review. They should be offered an opportunity to attend the decision meeting. Decisions must be communicated to affected parties If vendors are to be changed, added or consolidated, communicate that with all stakeholders. Identify your strategy for change – think this through carefully. 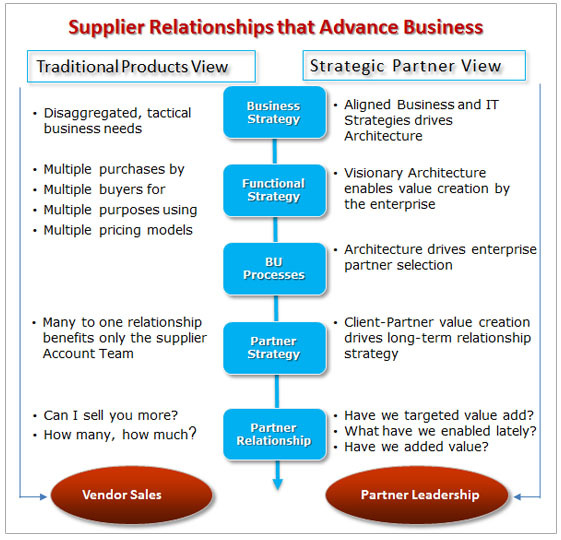 Discover the vendor’s strategy – confirm with analysts. Create and share the vision of the perfect outcome. Create and manage the environment. Find like-minded customers of target. Find an ally inside their organization. Plan and deploy clear Governance structures and processes. Know the past – business model, spend, demand, trends. Know the future – road maps, demand, options, likely financial outcomes. Apply agreed Metrics, Scorecards, SLAs, SLOs. Simplify the contracts structure – consolidate. Establish aggressive negotiation targets – read them daily. Leverage everything – compete their P&Ls. 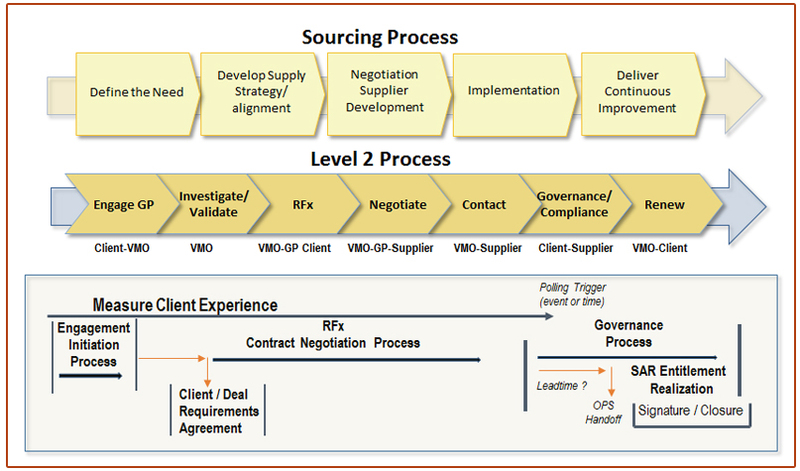 All of these areas in the chart below – strategic, sourcing, supplier management, contract management solutions, operational procurement and supplier performance are best leveraged when integrated as a single process and to assure smooth process flows from opportunity identification to sourcing to contract management and beyond to transactional processes and tools. In the early stages of negotiations determining the relationship between parties is essential. You need to outline what you want to accomplish, what are the common goals and what degree of complexity are you putting on the “High” to “Low” proprietary value. Negotiation Strategy is typically needed to resolve a conflict within the company or between parties to help create a better result that works for everyone. A negotiator does what both parties can’t do on their own; they mediate hard decisions and compromise for favorable effects. If the negotiating process does not have the right people handling the process the outcome is likely to failure. The concerned parties must have the trust of these representing them to implement an agreeable and reaching solution. Technology & Business Integrators, Inc. is 50 year old consulting firm that offers a wide range of service to customers who are looking to improve performance, increase productivity, lower costs, facilitate accountability or promote increased teamwork. Our strength is the acquired experience derived from participating in over 2000 diverse IT, HR, Finance and Procurement projects, consulting to top tier companies for half a century. Our clients leverage that knowledge to help gain the competitive advantage they seek; often with dramatic and long lasting positive results.